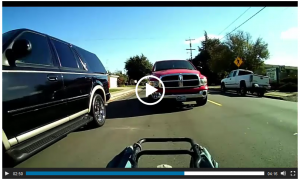 If you video a tailgating motorist blasting the horn at you, revving their engine, maybe “brush passing” inches from your elbow, that’s assault. And if that motorist actually hits you or your bicycle, that’s battery. But if that callous and aggressive attack on you isn’t witnessed by a police officer, that video evidence cannot be used– legally– to cite or arrest the perpetrator. You don’t have to let careless or belligerent drivers get away with it. For years the Department of Motor Vehicles has had a program to get bad drivers off the road. Click on this form to open a PDF you can fill out to start the process. Intended primarily to report elderly, blind, or impaired drivers whose conditions have deteriorated to the point they may be a threat to others, this procedure causes the DMV contact the individual to prove they still qualify to be licensed to drive. Increasingly now, bicyclists are using this process to turn in hostile drivers, those who buzz-pass in violation of the 3-Foot Passing law, or make dangerous “right hook” or “left cross” turns which put them in jeopardy. Rude, careless, and hostile often equals assault. Bicyclists are fully franchised users of the road. Motorists must respect your space, pass only when safe to do so, and at least show you the same courtesy they do other motorists. The DMV Driver Reevaluation form covers that. But will it get results? Lawyers familiar with the DMV’s process say it will, eventually. A driver properly identified on the form will be contacted and informed their behavior on the road warrants an interview. The process is as anonymous as the DMV can keep it– your identity should not be revealed but the nature of your complaint will be. 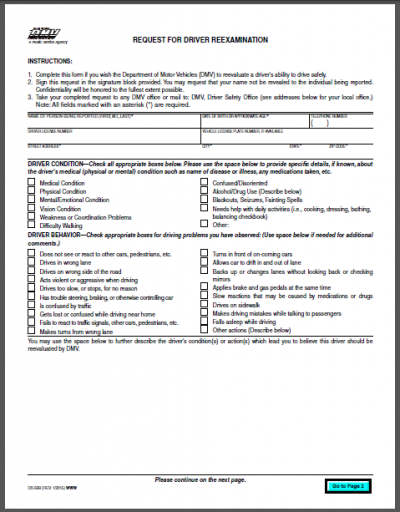 “Acts violent or aggressive while driving,” “Fails to react to traffic signals, other cars, or pedestrians, etc.,” “Turns in front of other cars [or bicycles].” When you check these boxes and add additional comments on the form you should get a DMV officer’s attention. And multiple complaints filed on the same driver will have real impact. The driver’s name is not essential. Contrary to the asterisk on the form, a complete license plate number and vehicle description can trigger the review process. If you post video evidence of hostile or reckless behavior on line, be sure to include a link on the form. That’s another reason to pack a GoPro or Fly6 camera. The California Association of Bicycle Organizations and committees within Caltrans are examining the form and reporting process to make it more responsive to pedestrians and bicyclists. We’ll update this column as news becomes available.